In English published on Antaiji Yearbook, newsletter of Antaiji monastery, Japan, on December 2004. In Italian it constitutes part of the introduction to the book Il buddismo mahāyāna attraverso i luoghi, i tempi le culture. 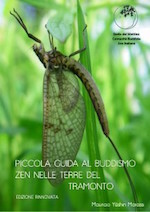 L’India e cenni sul Tibet, published by Marietti, Genova-Milano 2006. From many signs it is possible to suppose that Europe will be the stage on which a new chapter of the tradition born in India migrating more and more towards the East, and which we a bit carelessly call “Buddhism”, will be performed. If we look at the continuous thread between the Buddha and the above mentioned signs, we will notice a constant cadence in the ways and the times in which that way of grasping our own fate to keep it from deviating from its deep river-bed has been either different entities, “the buddhisms”, or only one essential path. Of course, when Śākyamuni’s original teaching began to develop, it was expressing itself in the shape and with the words of the culture that was then in use in his country. We can assume that Śākyamuni was speaking in māgadhī, the ancient language of modern Bihār, and the only available words to express the explosive news he had to communicate to the world were those already full with the meanings of another religion. In a situation like that, it was normal that who was more sharp and ready could receive the new even if it was the unprecedented, and soon availed himself of the Buddha teaching. Others, (maybe many, judging from some references among which the most famous is in the second chapter of the Lotus Sutra), were inclined to receive only what their minds could decode with the means then available: the thought, the culture, the observance of the rules and the literal following of the teaching. At that time, Buddhism could be actually accepted just by two kinds of elite. On one side a spiritual elite that was understanding, comprehending “in spite of all”. On the other side a physical and character conditioned elite composed by those who were able to submit themselves to severe ascetical practices and ready to accept and to obey to a minute rule, living almost completely excluded from the world, in a way very similar to that of śramaņa, the ascetics of the old tradition. These two tendencies have been present since the very beginning of the Buddhist community but never actually entered in a conflict because they weren’t generated by personal interests. Only one hundred years after the Founder’s death that they began to show themselves in a clearly differentiated way. Buddhist community was, and is, founded upon behaviour, upon practice, not upon doctrine, so to provoke a true schism it would be necessary to oppose different and irreconcilable affirmations about personal behaviour. But differences weren’t at all about what to do: they were about the deep sense of that doing. During the two following centuries, i.e. between the fourth and the second century B.C., even if with some difficulty, the two souls of the tradition could live together. In the meanwhile, around the middle of the second century during the rule of king Aśoka, the Buddha teaching in the form called Theravāda had been transmitted to Sri Lanka. From there it expanded itself towards Burma and Thai. In the mean time, also the world around the area situated between the Indo and Ganges’ valley was changing. Alexander Magnus had conquered Afghanistan and North Pakistan; his successors had arrived in the Punjab. In the Gandhāra area new forms of art appeared and they didn’t fear to represent the Buddha in the shape of a man. A new language, called “intentional”, began to be used and the new Buddhist texts were no longer written in Pāli but in Sanskrit, the “complete, perfect (language)” of the ancient Veda, at first in a form called hybrid Buddhist and then in the classic form. Almost at the same time many works with a strong characterisation came up: a new culture was flourishing. At last, those among Buddhists who could see a truth behind words, behind thinking, behind the speakable could have a wide and articulated literary body in which this absolute was continuously shadowed and skimmed. The “intentional language” gave the technique, the meagre ability of humour alternated with logic to maintain the discourse always out of apodictical statements and from private language. Even the personal presence and the preaching of the Buddha, that is the best we can imagine about positive opportunities, wasn’t enough to fully establish Buddhism: a few centuries of elaboration and growing were necessary so that it could develop into a culture able to contain it and to make it flourish. After another century, i.e. more or less during the time Jesus was going along his short wordily parabola, Buddhism silently began to spread in the wide China. As in India when Buddhism was been introduced, in China there was already an extremely refined religious philosophical culture. There was a subtle and accurate terminology, an expressive means, the ideograms, that was completely different from the vocalic alphabet used in India. Unavoidably the new religion began to express itself through the old culture of the new land, using the words, or rather: the ideograms, already used to express the concepts considered similar to those they wanted to speak about. From this situation such a deep and intricate confusion arose that we can still find traces of it even now, after two thousands years, here in the West, after Buddhism completed a full turn around the world. Also in this case it took a long time, more then three centuries, before that the new religion from West could have its own culture, by which all that part that can be expressed with words, ideograms and by the other expressive means, could be purely transmitted, distinguished from the meanings of the hosting culture. It was at that time that Chinese Buddhism flourished, in a shining and new way. And it developed in schools and original lines whose refinements compose many of the outlines of that panorama that today we too can begin to catch a glimpse of. Similar considerations can be made about what happened in Tibet, or about when Buddhism spread from China to Vietnam, to Korea and to Japan. In all these cases, comparing with the introduction of Buddhism in India and China, the only differences were that there wasn’t an elaborated philosophical religious culture yet, and it was Buddhism itself which contributed to form it, like in the case of Tibet. Or the religious philosophical culture was already formed in a close connection with the Chinese one as in the case of Korea, or alternatively the osmosis with Chinese culture had come on late and it was necessary to wait that Buddhism, Confucianism and autochthonous culture had the time to interact and to grow, as in the case of Japan. In this Country it happened in a way that we must distinguish the entry of Buddhism into three different phases: a first one during the sixth century, when the native culture composed by warrior myths and Shintō couldn’t yet express itself in a way complex enough to communicate the new meanings. Then, in the ninth to tenth centuries, we have a second phase of evangelisation in the forms of the schools flourishing in China at that time: Tantric schools and Tiantai, Huayan and Chan schools. It was during that time, at the very beginning of ninth century, that on Mount Hiei, near Kyoto, Saichō founded Enryakuji monastery, centre of the Japanese school Tendai. Enryakuji in the course of about three hundred and fifty years built the cultural, linguistic and expressive base to make Japan speaking, in Japanese, in a “Buddhist language”, without lisping and expressing the all meaning. In the thirteenth century, all the co-founders of that movement of renewal of Buddhism called “New Buddhism”, i.e. Dōgen, Hōnen, Shinran e Nichiren were trained and educated at the Mount Hiei school. It was on account of these men that Buddhism came to us as a truly universal path, with access doors with the lowest threshold. Nevertheless, without a culture which can be able to give it a voice and a thought, the “only one Buddhist practice”, born in Japan during thirteenth century and now spreading in the West, cannot take root in Europe, however much its access threshold could be universal and wide. The old texts of the “first Buddhism”, especially the pāli code of Sri Lanka now famous with the name Tipiţaka (or Tripiţaka in Sanskrit), have been translated and recently retranslated. On the contrary, the much complicated texts, where meanings are stratified with a foundation which cannot be grasped by thought, have been let alone. For instance, however much it could seem incredibly, the first direct translation from Sanskrit into Italian of the Lotus Sūtra was been published in 2001. 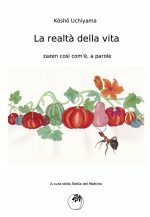 Diamond Sūtra and Heart Sūtra don’t have yet a direct translation from the original in Italian. The same is for Lankavatara Sūtra and Vimalakirti Sūtra. The Italian translation of Nirvana Sūtra from the Chinese Kumarajiwa’s version has been done but is unavailable. Without making a comparison between the contents, it is the same as if, supposedly, in Tokyo there wasn’t yet a translation, from the original in Japanese, of one or more Gospels. And then, especially about Chinese, Japanese, Vietnamese and Korean texts, the work of exegesis, of confrontation between sources and of an experimental language for translation has just begun. Most of the words, of the expressions, of the ways of saying used in our culture that have been related with a spiritual sense or with the spiritual edification are already full of Christian meaning. Certainly pure and saint, but different from how Buddhism would express them. We need a datum-culture, where those meanings could acquire visibility and a full cognisance of self. In this way they will generate the exigency to be expressed and they will bring forward to the creation of a new language. That not necessarily consists only of new words. I am afraid of religious utopias proposed as a way of life for everybody: past and present examples are enough to not try again superimposition that already had dramatic consequences. However, as a culture, it is possible to transmit to everybody some capabilities of view based on egoistic forms wider, more intelligent of those now dominant. Showing the good material effects to those who want to try it, lowering the conflict that generates suffering, without pretending that everybody would practice the “universal egoism”, that make us not forget any creature. I think, as it happened many times in the past, that without an accurate process of study, the forms of practice –like zazen- that many of us are teaching and supporting with much effort, even if they have the wonderful value of testimony, they don’t have the possibility of taking deep root neither to make themselves known because they don’t have words, expressions and thoughts with which to exist in the world of human beings.